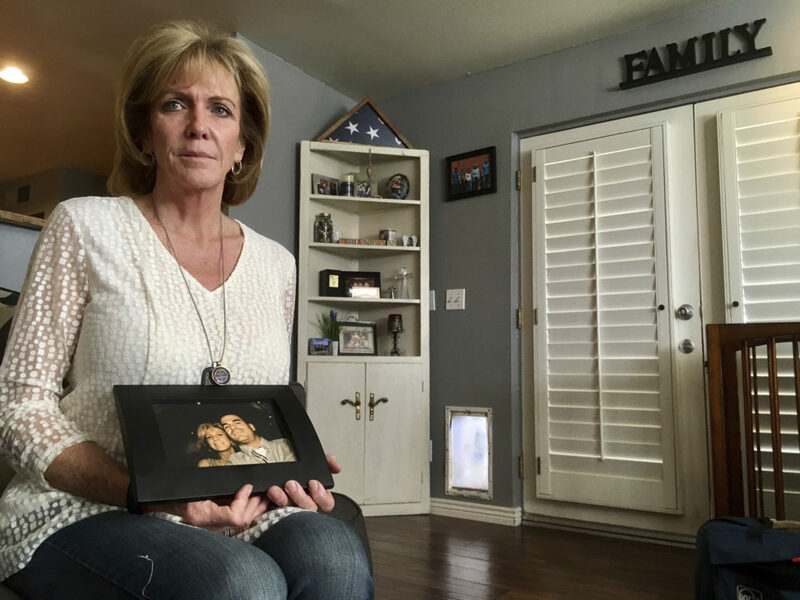 Mary Ann Mendoza lost her son Brandon in 2014, after his police car was hit by an intoxicated driver who was in the U.S. illegally. Mendoza is one of a number of parents who have been meeting with President Trump about how to tighten restrictions on immigrants in the country illegally. Here & Now's Robin Young speaks with Mendoza (@mamendoza480). "We had just celebrated Mother's Day on May 11, 2014, and had a wonderful day, and then he went on shift, and he stopped by to have dinner with me. And then the early morning of the 12th, I got a call from Afghanistan from one of his fellow Mesa police officers, who was also Air National Guard and deployed at that time, telling me, 'Mom, Brandon's been in a terrible accident.' I quickly got off the phone and tried to gather my thoughts and kept calling Brandon's phone, and he wasn't answering, and probably 10 minutes later, there was a knock on my door, and it was [the] Mesa Police Department, telling me I needed to come with him to the hospital. And I arrived at the hospital still not knowing what was going on, but when I saw the police presence at the hospital, I knew it wasn't good. "Probably 20 minutes after I arrived at the hospital, my son died in surgery, and my nightmare began." "He had been charged up in Colorado in the '90s for burglary and assaulting a police officer, and of course, usual fashion, they're given a court date to show up for, which he never did. And so he was on the run in our country. He was reapprehended in 2002 at the border coming back into the country, and the judge showed him leniency and let him back out onto our streets. "It was shortly a few weeks after Brandon's death that I wrote a letter to President Obama at the time, and my fight has always been about the leniency that is shown to illegal alien criminals in our country. I don't think that they should be out on bail." On due process for undocumented immigrants who commit crimes in the U.S.
"These illegal alien felons have already been convicted of crimes and have been put on a deportation list. But they're just left to roam our country. They want due process in our country, but they're not forced to serve the time like you or I would be. They're just deported. And next week, they'll walk back over the border, and they'll be back, because they know this is a joke." "I am satisfied with where it's headed. We have a Congress and a Senate who are putting up the roadblocks for not getting the border funding, the wall funding that we need. "Listen, $136 billion a year is spent on illegal aliens in our country, supporting them with health care, with education, with food stamps, with housing. If that was all cut off tomorrow, we'd have a border wall built in the next year, because that's where our taxpayer money should go, and that's where it would go if we cut off the support to these people." "Americans do support immigrants. And the difference between an immigrant and an illegal alien is, an immigrant has started their paperwork and they're coming into our country the right way. "It's just been proven by this latest wave of all of these people coming from Honduras and saying that they're fleeing violence. To say that they're afraid of gang violence isn't proof that their life is in danger. Look, you and I are afraid of gang violence here in the United States. It's all around us. "You know, we need to send the help and the resources, and these people need to start standing up to their government in their country and fight there." On whether she has been working with advocacy groups to stop drunken driving by both immigrants as well as people born in the U.S.
"I've been approached by them, but I've got my own fight in my belly of what I'm fighting about and the very reason of why my son was killed, and that's where I'm directing my energy, and obviously I'm against drunk driving no matter what. "Maricopa County, Arizona, has one of the strongest and [most] stringent drunk driving laws in the country, and the amount of times that it happens here is staggering."